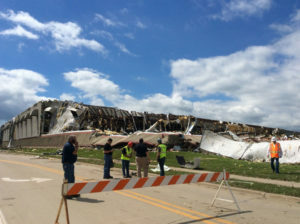 NWS photo of Lennox Industries tornado damage in Marshalltown. The experts at the National Weather Service are finished with their initial investigation of last Thursday’s flurry of destructive tornadoes that touched down in central Iowa. Still more tornadoes may be added to the list which does not include the two tornadoes that touched down that same day in southeast Iowa near Keosauqua. 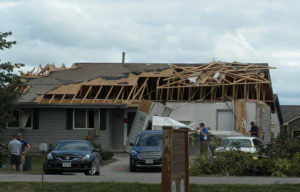 Both were EF-1s, according to an official at the Quad Cities office of the National Weather Service. A home damaged by a tornado in Bondurant. As many as 17 people were reported hurt in the storms, and no deaths. In addition to the tornado that hit Marshalltown, two separate twisters landed in and near Pella, and two more landed in and near Bondurant. The other tornadoes are confirmed near the following towns: Ankeny, Clarion, Blairsburg, Williams, Story City, Prairie City and Monroe.